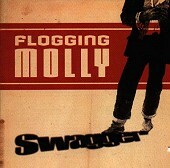 Like The Pogues, Flogging Molly blends Celtic sounds with a hearty punk touch. Drinking songs for the working man, this band kicks out the jams over and over again on their thirteen-track debut. Loud, liquored up, and ready to get you drinking too, these Celtic punks guzzle down the alcohol-drenched, sweaty, aggressive Celtic sounds while whipping up a warm-hearted, folk-infused punk fusion. "Salty Dog" lets it all go, and from there, it just doesn't give up. Relentless in its pursuit to win you over, "Life In A Tenement Square," swaggers along with a rumbling rhythm section, "Black Friday Rule" draws you in like a good bar fight and then throws you out, well, like a good bar fight. And then there is "These Exiled Years," a 'slow' song for you to sit back and stagger along too. If you're looking for good, entertaining music that you can drink too without feeling guilty or too riled up, Flogging Molly provide the soundtrack to your weekend. Regardless of weather, location, or whom you're around, Flogging Molly breaks down all barriers and draws everyone front and center. I'll give it an A.